Malaysia Airlines (MAS) is finally starting to implement a long overdue restructuring aimed at restoring profitability through capacity reductions, job cuts and efficiency improvements. A rebranding is also being considered as the flag carrier transitions to a new company and starts a new chapter. MAS has been in need of a major overhaul for several years but its predicament became more dire in 2014 due to the MH370 and MH17 incidents, coupled with overcapacity in its home market. The Malaysian government was quick to respond by unveiling in Aug-2014 a restructuring initiative and a plan to buy out minority shareholders. MAS de-listed in late 2014 but has been extremely slow in implementing other changes, including job and capacity cuts. With the arrival of its new CEO, Christoph Mueller, MAS is finally moving forward with job cuts ahead of the delayed transition to a new company, which is now slated to take over from the current ailing company on 1-Sep-2015. Capacity adjustments have started with the recent suspension of services to Frankfurt, Kochi, Krabi and Kunming. Government-owned investment firm Khazanah initially unveiled a comprehensive turnaround plan for MAS in Aug-2014. The plan envisioned slashing about 6,000 jobs, representing about 20% of the workforce, and cutting long-haul capacity while increasing focus on regional operations within Asia-Pacific and on partnerships to cover other markets. At the time Khazanah expected a new company to take over in Jul-2015 along with a new management team, a new headquarters facility at Kuala Lumpur International Airport (KLIA) and a reduced workforce. Khazanah increased its shareholding in MAS from 69% to 100% in late 2014. But MAS/Khazanah has taken longer than expected to identify which employees to retain and to finalise the new corporate structure. On 1-Jun-2015 MAS sent out termination letters to its approximately 20,000 employees. At the same time about 14,000 of the employees were offered jobs by the new company, which is now expected to begin operations on 1-Sep-2015. While salaries will be lower, performance-related bonuses could provide an opportunity for employees to earn more than previously while incentivising productivity. MAS’ new corporate structure also includes more than 10 subsidiary companies with their own performance metrics and profit/loss responsibility. MAS business units and subsidiaries have traditionally been saddled with overstaffing and productivity issues. They are now in the process of being overhauled, aided by multiple consulting companies specialising in a wide range of business segments. The corporate restructure is an extremely costly but necessary exercise as MAS has just one final chance to rectify decades of problems and chart a sustainable path in an increasingly competitive industry. Despite earlier attempts at improving the airline's performance, the previous structure lacked transparency and was inefficient, forcing the airline unit to incur higher than average costs for items such as aircraft maintenance. MAS could simply not afford to continue paying above industry norms for goods and services, whether insourced or outsourced. The new structure should reduce the cost of services that are provided internally. MAS meanwhile is in the process of renegotiating – and in some cases cancelling – almost 4,000 contracts with external suppliers. The Malaysian parliament in late 2014 gave MAS the right to cancel contracts as part of the transition to the new company, which was initially referred to as “NewCo” and has since been named MAS Bhd. The controversial MAS Act gave the ailing flag carrier the ability to reset and start afresh similar to the Chapter 11 bankruptcy processes in the US. MAS has since been talking to suppliers and the delayed transition to the new company essentially gives the airline group two extra months to finalise new contracts as it strives to narrow the cost gap with LCC competitors. The longer than expected transition period to the new company is not ideal as MAS has continued to operate during the interim period at a bloated and inefficient level. Some of the best employees in the meantime have left, quickly securing other jobs in the industry rather than deal with a prolonged period of uncertainty. Khazanah also has been slow to meet its pledge to upgrade the top 500 positions at MAS with global aviation specialists from around the world. But the Malaysian government took an important step in Dec-2014 in appointing Christoph Mueller, a seasoned and well regarded airline industry executive. Mr Mueller took over as MAS CEO on 1-May-2015, becoming the first expatriate to lead the Malaysian flag carrier. Mr Mueller will need a strong management team and unwavering support from the government, including funds for training which are needed to upgrade the skills of employees. For years MAS failed to invest adequately in its staff while also failing to implement headcount reductions and productivity improvements. Union opposition and political resistance to change resulted in several prior restructurings not going deep enough to fix root problems. As competition intensified, particularly with LCCs regionally and Gulf carriers in the Malaysia-Europe market, MAS became unsustainable. MAS was already struggling long before the twin tragedies of MH370 and MH17 in 1H2014, accumulating over USD1 billion in operating losses in the three years prior to MH370. Losses have since accelerated partially due to a reduction in demand following the two incidences but primarily because of extremely challenging market conditions including overcapacity. MAS and Malaysian medium/long-haul LCC AirAsia X both pursued overly ambitious expansion in 2H2013 and early 2014, particularly in the Australian market. MAS also expanded rapidly in the domestic market in 2013 in response to the launch and rapid expansion of Malindo Air, a new hybrid carrier from Indonesia’s Lion Group. MAS is no longer reporting financial or operational figures as it is no longer publicly listed. But MAS has continued to price aggressively and operate at relatively high capacity levels in 1H2015 while not yet improving productivity. Lower fuel prices have obviously helped mitigate the losses but there also have been huge restructuring costs. Khazanah initially pledged MYR6 billion (USD1.63 billion) in financial support. Khazanah’s recovery plan envisioned restoring profitability by the end of 2017 and eventually re-listing MAS and/or potentially selling a strategic stake. Mr Mueller, who held his first press conference as MAS CEO on 1-Jun-2015, has reiterated similar goals and stated he hopes MAS will be break-even by 2018. Mr Mueller also foresees the potential of selling a strategic stake but recognises the airline first needs to focus on the turnaround. While MAS is hoping for a recovery in yields, potentially aided by a rebranding, the biggest driver to the hoped for turnaround will be costs. MAS is targeting a 20% reduction in costs as staff levels and the number of suppliers are reduced. MAS has finally begun cutting capacity in recent weeks as it has suspended services to four international destinations. But the reductions are still relatively small and current MAS capacity is still well above 2013 levels. MAS currently provides about 285,000 weekly domestic seats when including regional subsidiaries Firefly and MASWings. Domestic capacity is only down by about 1% compared to Jun-2014 levels, with a 27% increase at Firefly, which has been growing its turboprop fleet, offsetting about a 5% reduction at MAS mainline. AirAsia also has cut domestic seat capacity by about 5% over the last year while Malindo has expanded by only 4%, according to CAPA and OAG data. Total domestic capacity in Malaysia is up only marginally (about 2%) compared to Jun-2014 but is up by over 30% compared to Jun-2012. Malaysia’s domestic market suffered from overcapacity in 2014, pressuring yields and load factors. 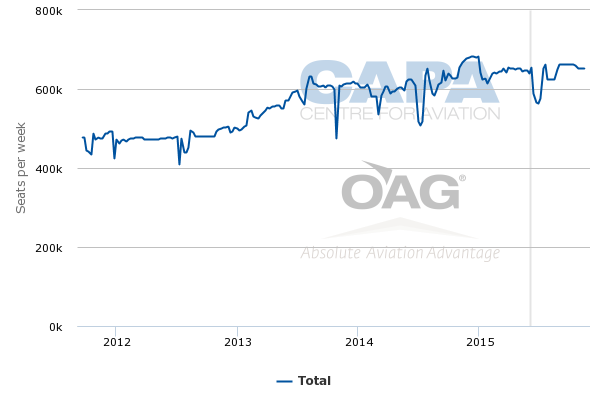 Conditions have improved slightly in 2015 as airlines have taken a more disciplined approach to capacity. But competition remains intense and it will likely take time for the capacity added in 2013 and 2014 to be fully absorbed. Mr Mueller has said MAS plans to maintain its domestic network as it transitions to the new company. Further expansion of the domestic turboprop operation is expected as the group is slated to take delivery of six ATR 72-600s in 2015. This includes two growth aircraft for Firefly, two replacement aircraft for Firefly and two replacement aircraft for MASWings. Firefly is expected to expand its fleet by another two aircraft in 2016, resulting in further domestic capacity increases on regional domestic routes and likely again offsetting any domestic capacity declines at MAS mainline which will likely again be relatively modest. Malindo is also likely to continue expanding its domestic turboprop operation over the next year although jet expansion is likely to focus on the international market. AirAsia, which has been focusing on trying to build back domestic yields, is unlikely to expand domestically but is also unlikely to cut capacity further as it will be keen to maintain its share of the market. The potential launch of planned Malaysian start-up flymojo could make the Malaysian domestic market even more challenging as it is already oversupplied and remains highly competitive. In the Malaysian international market MAS currently provides about 263,000 weekly seats, which represents about a 9% reduction compared to Jun-2014, according to CAPA and OAG data. These figures exclude Firefly, which has a limited short-haul international turboprop operation consisting of about 15,000 weekly seats. 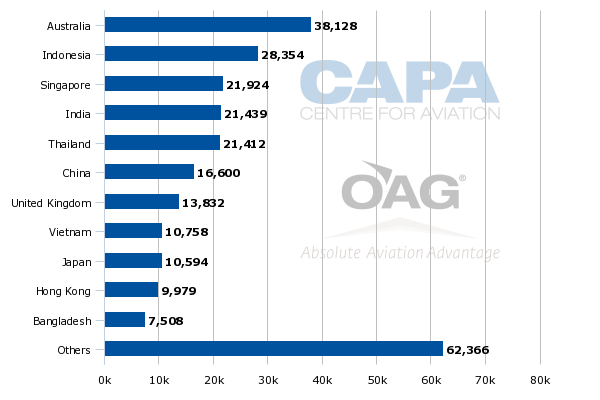 MAS international seat capacity remained slightly above 2014 levels through the first four months of 2015, according to CAPA and OAG data. 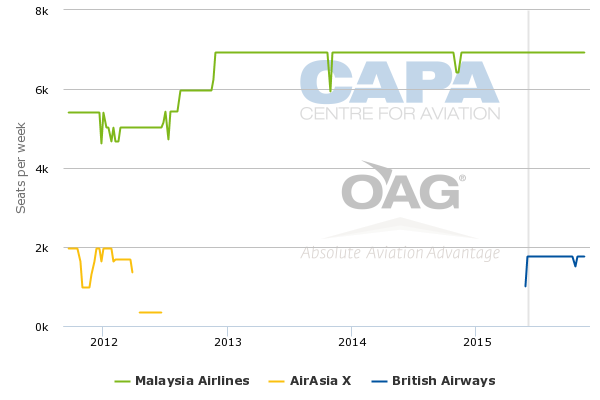 Seat capacity has come down slightly since the end of Apr-2015 as MAS began to cut its international network. But current international capacity levels are still slightly above Jun-2013 levels and are more than 20% above Jun-2012 levels. MAS suspended services to Kunming in China on 30-Apr-2015, to Krabi in Thailand on 6-May-2015, to Frankfurt in Germany on 29-May-2015 and to Kochi in India on 1-Jun-2015. Kunming was served with three weekly 737-800 flights, Krabi with two daily 737-800 flights, Kochi with one daily 737-800 flight and Frankfurt with one daily 777-200 flight, according to OAG data. While MAS plans to focus more on its regional international network as it restructures Kunming, Krabi and Kochi were not considered core or strategically important destinations. All three are served by AirAsia and are generally more suitable for LCCs as they have relatively limited premium or business demand with limited demand for connections beyond Kuala Lumpur. Malindo also launched services to Kochi in 2014 while AirAsia added capacity to Krabi, putting pressure on MAS. MAS only launched Krabi in early 2014 and quickly expanded in the market from an initial less than daily service. But Krabi was always considered an alternative to nearby Phuket, where expansion has not been feasible over the last couple of years due to slot constraints. MAS is maintaining four daily flights to Phuket. The suspension of services at Kunming is sensible as MAS has been impacted by the drop in inbound visitor numbers from China which began after MH370. MAS in 2014 also cut one of its two daily services to Beijing and dropped plans for adding a second daily flight to Guangzhou. It also serves Shanghai with 13 weekly flights from Kuala Lumpur and two weekly flights from Kota Kinabalu. China remains an important market for MAS – as its largest market in North Asia – and could see an improvement in demand following the likely rebranding. Kochi would have been a challenging market to sustain as there are no capacity constraints to secondary cities under the Malaysia-India air services agreement. Expansion by any Malaysian carrier to MAS’ five remaining Indian destinations– Bangalore, Chennai, Delhi, Hyderabad and Mumbai – is currently precluded as there is no spare capacity in the bilateral. 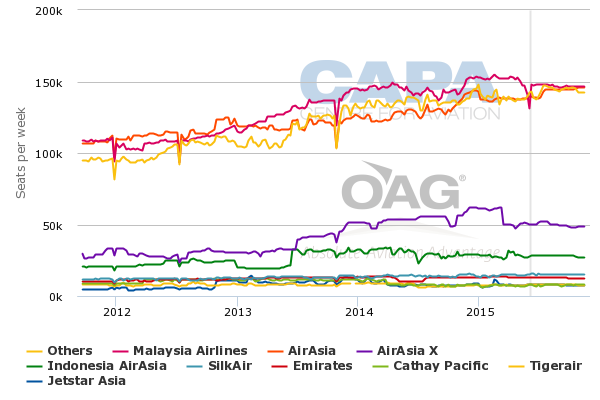 This gives MAS a competitive advantage as Malaysian LCCs are currently unable to expand in any of these markets. India also remains a strategically important market and MAS would likely seek additional capacity entitlements to its existing destinations if Malaysia is able to forge an expanded agreement with India. Frankfurt is the most significant cut and at least partially meets Khazanah’s pledge to cut long-haul capacity. 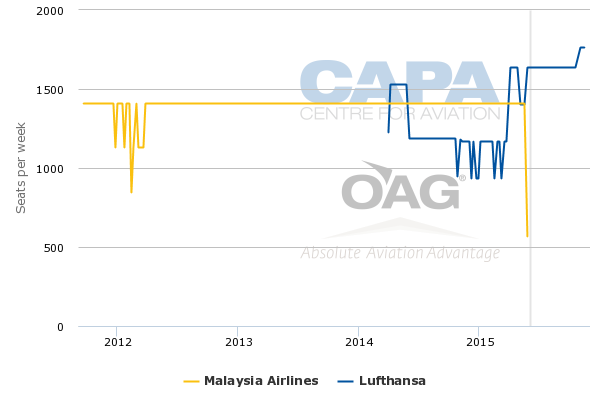 MAS has struggled in the German market, particularly after Lufthansa launched five weekly non-stop flights on the Frankfurt-Kuala Lumpur route at the end of Mar-2014. Lufthansa previously only served Kuala Lumpur via Bangkok. Lufthansa upgraded Frankfurt Kuala Lumpur from five weekly flights to daily at the end of Mar-2015. It would have been difficult for MAS to be profitable in the Frankfurt market without a partnership on the Frankfurt end. KLM is MAS’ main European partner, making Amsterdam more viable, while London and Paris are bigger local markets. At least for now MAS is not planning any further network cuts. But new capacity reductions on some existing routes are expected as MAS continues to implement its recovery plan. This can be achieved by cutting frequencies and down-gauging some existing flights to smaller aircraft. While the recovery plan has always indicated that the long-haul operation will account for most of the capacity reductions, there are limited opportunities for further long-haul cuts. Capacity reductions are therefore likely across some destinations within Asia-Pacific although Kochi, Kunming and Krabi may be the only destinations that are axed entirely. The suspension of services to Frankfurt leaves MAS with only six destinations outside Asia-Pacific – Amsterdam, Dubai, Istanbul, Jeddah, London and Paris. MAS had already significantly reduced the size of its long-haul network during prior restructurings. Los Angeles was axed in Apr-2014 while Buenos Aires, Cape Town, Johannesburg and Rome were cut in early 2012. Dubai was also cut in early 2012 but was reinstated in 2013. Dubai is now served with MAS’ A330 fleet, which is also used on services to Australia and some flights within Asia. Jeddah and Istanbul are also within the range of the A330 and could potentially be downgraded from the 777-200. The A330 and 737-800 will remain the workhorse for MAS. Both fleets are relatively new – about three years old on average. MAS is now planning to retrofit its A330s to incorporate a new lie-flat business class product. MAS currently has an angled lie-flat product in a two-two-two configuration in its A330s. The existing premium product is not competitive with Gulf and other Asian carriers on longer medium-haul routes. MAS does not have any outstanding commitments for additional A330s or any other widebody aircraft. MAS' only outstanding commitment for jets consists of 10 additional 737-800s, some of which can be used as replacements as the leases on some of its oldest 737-800s are expiring in 2016. MAS continues to review options for its long-haul fleet. Mr Mueller has confirmed MAS is seeking to sell or sublease two of its six A380s. Khazanah, which owns all or most of MAS’ A380s and 777s, also briefly put out a tender to sell several of the carrier’s 13 777-200s. But the tender was quickly rescinded, an indication MAS will stick with the 777-200s, which are over 15 years old on average, for at least the medium term. Mr Mueller recently stated that the 777-200s will be retrofitted with lie-flat business class seats, another indication that at least some of the aircraft will be extended. The 777-200s now have an old generation angled lie-flat product in the business class cabin in an unpopular 2x3x2 configuration. Only the A380s, which are less than four years old, feature a lie-flat business class product. The A380 is clearly too much capacity for MAS and Khazanah entertained proposals in recent months for selling the entire fleet as it reviewed MAS’ widebody options. But Khazanah would have to take a huge financial hit to sell or sublease all the aircraft. At this point the government only seems willing to take a hit for a portion of the fleet. But operating only four A380s does not seem too logical as it is subscale. MAS may be keen to keep a small fleet of A380s for London, which it currently serves with two daily A380 flights. Kuala Lumpur-Paris is the only other route currently operated with the A380. A smaller widebody could be a better fit over the long-run, particularly if MAS does not want to follow Thai Airways in cutting back London from two to one daily flight. Less capacity on London would also make a potential partnership with British Airways more feasible. BA launched services to Kuala Lumpur in late May-2015 and does not codeshare yet with MAS although both are members of oneworld. MAS also does not yet work with Qantas, which sponsored its early 2013 ascension into oneworld. But a MAS-Qantas codeshare partnership would be difficult as MAS-Qantas relations soured significantly after Qantas decided to partner with Emirates, which competes aggressively against MAS in the Malaysia-Europe market as well as on the Kuala Lumpur-Melbourne route. Eventually MAS will likely acquire a new generation widebody aircraft such as the A350, 787, 777X or A330neo. It does not make sense to continue over the long-term with more than one long-haul aircraft type as only four of MAS’ remaining routes are currently out of the range of the current generation A330 – Amsterdam, London, Paris and Auckland. All four of these markets remain strategically important to MAS and are performing relatively well although are not likely profitable. More efficient long-range aircraft along with new or augmented partnerships would significantly improving MAS’ long-term position. MAS still faces huge obstacles and will need to make more difficult decisions over the next year. The flag carrier has only just started implementing long overdue changes and adjusting its strategy. A new chapter will begin as the new company finally takes over on 1-Sep-2015. But in many ways the end of the lengthy and costly transition period only represents the beginning of a turnaround that will be extremely difficult to complete successfully. The steepest hills remain unclimbed.